In this file photo, Summit County senior planner Don Reimer addresses the Board of County Commissioners, (from left to right) Dan Gibbs, Thomas Davidson and Karn Stiegelmeier, during a public hearing pertaining to the Keystone PUD. Vail Resorts is again asking the Board to amend the area's zoning regulations so it may install bunk beds at its Tenderfoot employee housing complex. Vail Resorts is in the process of again pitching to Summit County dorm-style living at some of its employee housing structures in Keystone. In early spring, the Broomfield-based company — and operator of Keystone Resort and Breckenridge Ski Resort in the county — applied to Summit’s planning department to add bunks at the Tenderfoot Subdivision by revising the document that sets the area’s zoning regulations, the Keystone PUD. Citing the shortage of housing in the region, Keystone Resort vice president and COO Mike Goar penned a March 25 letter to senior planner Don Reimer asking for the changes, specifically requesting the number of beds allowed in each of the complex’s 126 two- and three-bedroom units be permanently increased to four. Presently, Tenderfoot’s three buildings provide a maximum of 358 beds to seasonal workers. The planning department estimates that the approval of Vail’s petition would increase that number by 146, for a grand total of 504 beds. This same topic of conversation initially came up between the county and Vail Resorts this past November after the resort company hatched the idea of bunks to help resolve the intensifying housing squeeze felt across the community. Vail agreed not to install the additional cots but, by December, reversed course, suddenly — and controversially — springing the mandatory plan on its existing employees living at Tenderfoot during a Dec. 15 meeting. The strategy — one the resort insisted was never set in stone but voluntary, despite what employees and the Summit Daily witnessed at that gathering at Keystone’s Mountain House a month into this past ski season — caught the county off guard. After then altering course because of a firestorm of bad publicity and just three employees volunteering to take on the bunks for the remainder of the 2015-16 season, the county and resort settled on once again working together to find a seasonal employee housing solution moving forward. Tenderfoot’s two-bedroom units total roughly 550-square feet, and its three-bedroom units 521-square feet. If Vail’s new proposal were accepted, four occupants would receive just better than 135-square feet per person in the discount-rate two bedrooms. For the three-bedroom units, four individuals would receive about 130-square feet each. Similar spatial allowances already exist in Sage Brush, another nearby Keystone employee housing development. Reimer noted, though, that his department has “significant concerns” with Vail’s plan based on its overall framework. First, there are worries over the increased problems it will create with parking on an area already starved for space. The current zoning permits as many as 182 spots, plus nine for handicap use, near Tenderfoot. The planning department’s report suggested that no fewer than 146 more parking spots exist at an underused, adjacent land parcel currently acting as resort storage. It stated it believed this would serve as an adequate location for more temporary employee parking. Based on the county staff’s concerns, Keystone submitted a revised letter to the planning department on May 16, which is now under consideration, agreeing that the extra beds be in place for just two years — the upcoming 2016-17 season as well as 2017-18. Permission beyond that would require further county approval. The resort’s offer to come up with a parking management plan by Oct. 1 — a date the planning department already stated would be too late to address additional parking needs by a likely November implementation — went unchanged. Keystone’s other self-imposed condition of the submission of an application for construction of additional employee housing in the Keystone area on land owned by Vail Resorts by Nov. 1 also remained from the original letter. Vail Resorts previously committed $30 million to workforce housing across California, Utah and Colorado, including in Summit County, but has yet to name specific projects since that time. 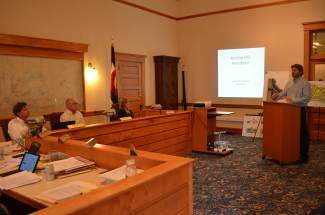 Summit’s Board of County Commissioners was set to listen to Vail’s position on Tenderfoot at a public hearing on May 24, but the resort requested a three-week continuance to the county government’s regular meeting on June 14. When that hearing arrived earlier this week, Vail again asked for a two-week delay until the meeting on June 28, which the commissioners granted. Vail and county staff, however, were set to meet in the late afternoon Thursday, June 16, in a private meeting to discuss the planning department’s comments and concerns. Asked for clarification on why Vail Resorts has now twice rescheduled a public hearing on the matter, a spokesman for the company provided a written statement. Unless postponed again, the county is scheduled to hear Vail Resort’s case for bunks at Tenderfoot the afternoon of Tuesday, June 28. From there, the commissioners will make a decision on the terms Keystone must abide by if approved and whether to allow the additional beds at all.